Does Your Customer Know What They are Signing off?? Just back from SpeechTEK Europe 2010, the first SpeechTEK to take place outside of the US, which was great fun. I gave a presentation on “The Eternal Battle Between the VUI Designer and the Customer“, which went down quite well (more on that in my next blog), heard many interesting new ideas about how normal people view normal communication channels to a company or organisation (the Web is prevailing but multimodality and crosschannel communication will be indispensable in a couple of years), heard about new applications of speech and touchtone and any challenges they are facing, and met up with loads of people I know in the field from companies I’ve worked for and cities I have worked in. I have started a few projects and collaborations as a result (again to be announced in my next blog), but for now I would like to share my presentation at SpeechTEK 2007 in New York on Monday 20th August 2007 (how time passes! ), entitled: “Does Your Customer Know What They are Signing off?”. As it says in the accompanying blurb: “This presentation stresses the importance of incremental and modular descriptions of system functionality for targeted and phased reviews and testing. This strategy ensures clarity, consistency, and maintainability beyond the project lifetime and eliminates the need for changes midproject, thus both managing customer expectations and protecting the service provider from ad-hoc requests.“. The idea is to have a standardised way to document speech application design both in terms of call flow depictions and in terms of functionality description. 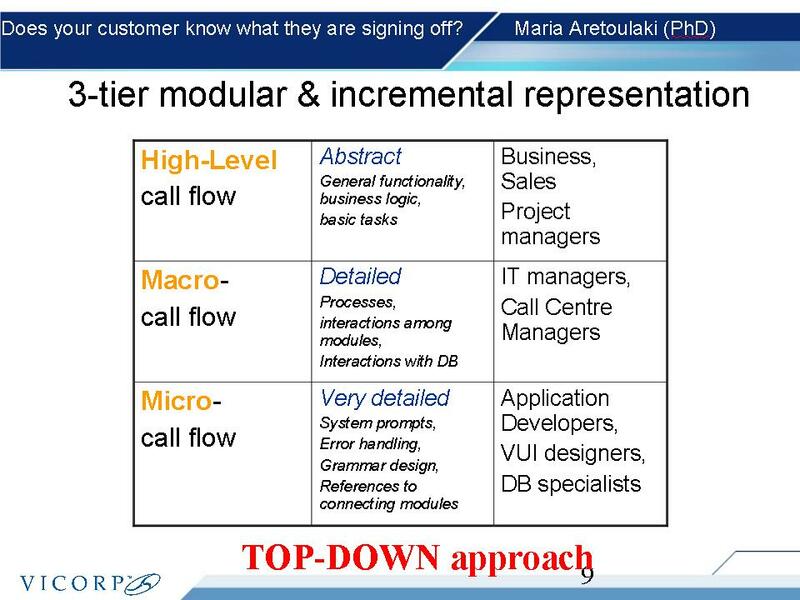 In addition, 3 different tiers of functionality and call flow representation are proposed, from the more abstract High-Level design (what range of tasks can a system perform? ), to the rather detailed Macro-Level (all the user interaction and back-end processes and their interdependencies), to the very detailed Micro-Level which documents every single condition, system prompt and related recognition grammar. I gave this presentation when I was Head of Speech Design at Vicorp, although the basic ideas behind it matured during the time I was Senior VUI Designer at Intervoice (now Convergys).